From the sensation of falling to stepping inside another world, there’s nothing quite like virtual reality. Now a Vancouver company is bringing that technology to you… anywhere, anytime. Mobile Reality is the first and only mobile virtual reality entertainment centre in the world. 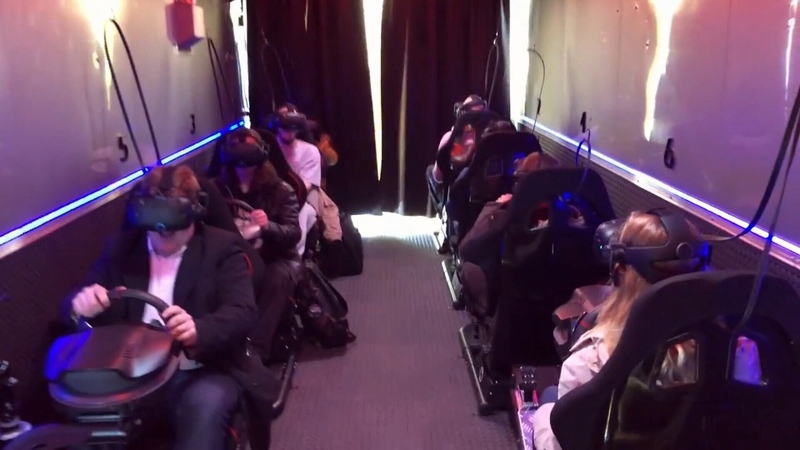 On the outside it looks like a food truck, but on the inside eight stations are interconnected and equipped with the latest in VR technology, allowing players to lose themselves in another world. Co-owner Scott Belyea says the fully customized trailer is up for hire for conventions, events or even a party. “We pull up and we play,” explained Belyea. Or if it’s just parked in your neighborhood you can book a time online, at a cost of $20 a session. Belyea’s business partner Dave Rice says this way most people can experience VR without the high cost of buying the equipment. "I like seeing people happy," said Rice. The company says the Mobile Reality games are quick and easy to learn so you spend less time figuring out how to play and more time playing. “On the menu we have car racing, flight dog fighting in the sky. We have zero G racers," said Belyea. Local game producers like Qualicum-based Cloudhead are early entries into virtual reality arcade games and so is a Richmond VR arcade called Univrs. Mobile Realtiy will be showing up at events like the Abbotsford Airshow and conventions, but they’re still trying to find a way to get a business licence to park in Vancouver. It’s so new at this point, the city hasn’t developed a permit for it yet.